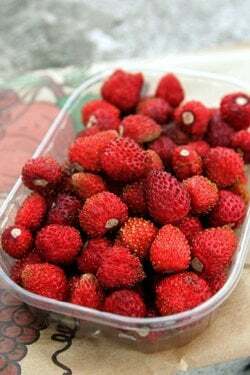 When I worked as a baker in California, we’d get three flats of fraises des bois (“strawberries of the woods”, or wild strawberries) for a few precious weeks in the summer, cultivated by a woman who lived about an hour north of San Francisco. Each intensely flavored berry, no bigger than the tip of a pencil eraser, had to be hand-picked and took someone nearly an hour to collect one basket’s worth of them. I don’t remember the exact price of each basket that we paid (was it $6 ? ), but they were expensive back in the 80s. Added to that, you must use fraises the bois the same day you get them because they break down pretty quickly, and by the next day, it’s too late to serve them fresh. A few times when I drove up there to pick them up, the heady smell of the tiny, wild strawberries in my car drove me nearly insane. I was reading through an online discussion the other day and someone said that what they’d like to see were stores offering things of better quality, at lower prices. Not to harp on the economics of food, but things costs what they do because of the work involved. The bacon cured by the woman who lives in the boonies, who drives it to the local market, is going to cost more than the stuff packed in slick, shiny plastic sleeves at the supermarket. A bar of bean-to-bar chocolate is going to be more than a bar of chocolate churned out by a major multinational conglomerate. And fresh garlic flown in from Argentina and China often costs less than the stuff grown a few miles a way – which as I write that, sounds really absurd. The whole thing sometimes seems out of whack. Living in France, where food is generally not inexpensive, I’ve learned to bite the bullet and just buy something amazing because I just really want it – price be damned. So when I was paying for a barquette of their regular (and utterly gorgeous) regular strawberries, as the vendor was handing me my change, I saw these tiny, imperfect fraises des bois and decided to splurge on them for myself. On the way home, I made a detour to my favorite cheese seller and picked up a cup of handmade fromage frais, a sort of fresh cheese with a light tang similar to crème fraîche, but less rich. Which is not something that really exists in America, except from small-scale producers, but if you buy a good one, it’s incredible with fresh berries, in France or elsewhere. And yes, the good ones do cost more. Sorry. But man, was that good. Right before digging in, I sprinkled some natural sugar over the top then plunged my spoon in. Each bite reminded me how good food can be. So while I may be a little poorer today, on the other hand, I’m a whole lot happier. Wow! Thanks for reminding me that I have some fraises des bois just about ready to be picked in my back yard.They grow everywhere in the Gaspé Peninsula and make some of the best jam if you have the courage to pick these tiny jewels.Beautiful pictures as usual, David! I love fraises des bois and your pictures really bring them alive. Dude, you have fresh wild strawberries with natural sugar and cream. Money is nothing compared to that. David….you made me think of something else that I bought here in France and have not seen since: “asperges des bois” or “aspergettes”. I bought it at Espace Fraîcheur (now Grand Frais). Available only in spring, I think. These were so incredibly subtle and delicious. I wonder if you have ever seen or heard of them? When I was a little girl in Nebraska living in the suburbs, I used to go to the nearby woods in the spring and pick wild strawberries…..so incredibly delicious. If you take a trip to the alps right now (well, most years it is right now — the weather HAS been weird this year though..) you can get tons of these free if you’re willing to look on various trails for them. I spent all my childhood (says the 22 year old ;) ) summers in the alps and those strawberries were one of my favorite parts of going there :P (because, you have to admit, it kind of got boring other than them! hehe) My parents and grandparents would pick cups of them, which we kids would promptly devour in 1/100th of the time they took to pick. They can be grown around paris too, actually… my grandparents have some in their backyards o.O But eh, in the alps, no need to even make an effort to grow them. Kathy: Are you thinking of these (the first photo in that post)? Elodie: Yes, it does take a while to find and pick them when they’re truly wild, but you appreciate them all the more! damn, they grow in a small park not a stone’s throw away. but unfortunately, as nice as the park is, there are still people that use the bushes for less enticing things than picking wild strawberries. damn them. thanks for reminding us of the pleasures of good food. never stop! Simple food is always the best and always worth the splurge! David, do you have a recipe for fromage frais? I know how to make crème fraîche with a culture… do you know what the differences are between the two? Perhaps using milk instead of cream? i have a neighbor who’s growing them on his curbside! (in l.a.!) they are gorgeous, growing like gangbusters and more-ishly delicious! thx for reminding me, he’s promised to tell me who helped him with his garden – and where i can get some fraises des bois of my own! on a more serious note….groceries COULD be cheaper. all you have to do is look at the Forbes richest people list and count the supermarket magnates and walmart family members. we are talking BILLIONS, peeps! Living in northern California, I have access to a lot of produce that’s actually cheaper simply because it doesn’t need to travel far to be sold. I love keeping track of seasonal produce. Specialty produce can definitely get expensive. Fiddleheads and black raspberries can certainly fetch a high price tag, even if they are local, simply because they’re just that special. I’ll need to find this farm you speak of that sells these strawberries. So gorgeous. David: Thank you for the reminder that artisan or small batch food is more expensive for a reason . . . not only because of supply and demand, but because of the work involved by the individuals who produce and sell it. Although I now live in Northern California, I grew up on a working dairy farm (in Michigan’s U.P.) — while I am grateful to be able to pick up a gallon of milk at my local grocery, I also am knowledgeable of the work involved in getting that milk to market — especially for the small farmer. Although we no longer run a dairy herd back home, I am forever grateful for my upbringing and the appreciation that I have for local farmers — and that my town has a Farmer’s Market and CSAs available. Thank you for today’s post. You may have thought it was about fraises des bois — but for me it was about so much more. A fresh local strawberry tastes a thousand times better than those icky winter ones that are flown in from who knows where. I have a family of 6, so the cost of food can play a large part in my food buying choices at the grocery store, but there are just some things that are always worth spending a little more. Like the fresh fruit in summer. My justification is that the good food is actually cheaper in the long run than the junk food. Your post reminded me of one of the recommendations from Michael Pollan’s In Defense of Food (fantastic book, by the way): “Pay more, Eat less.” I find that I’m willing to pay more for good food (particularly from our local farmers), and when it’s that good, I don’t need to eat a lot of it. What wonderful memories of France you bring to mind. I lived in Grenoble for three years awhile ago. I remember my first taste of fraises des bois- what joy! And what a perfect union with fromage frais- I was so taken with the little strawberries that I planted some in my kitchen garden upon returning to the states. Usually, my handfull of ripe berries never made it into the kitchen… it was my secret little indulgence right there in full sunshine. The flavor, the perfume- priceless! I think people who want their food to be cheaper have become disconnected with where food actually comes from. Like you said, amazing strawberries (or anything else) takes time and labor. I recently listened to a newscast on how the only way farmers can make food cheaper is with cheaper labor because the price of energy, equipment, etc. is out their control. And cheap labor is exploiting people. When we enjoy a beautiful strawberry we should feel happy that we are paying for the livelihood of the stewards of nature. Seasonal, fresh = the best! Will a litterbox work or would they leave a mess? If your Wild Strawberry cannot be tamed. I planted fraise des bois last summer and now they are just coming on! 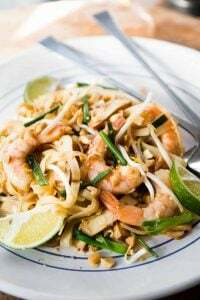 How about sharing some favorite recipes with them? For J.W., who asked about a recipe for fromage frais: It is basically very young cheese, so it is made by adding rennet to cultured milk. The culture gives the milk a bit of tang whereas the rennet causes it to set. The culture can be added from the whey of a commercial fromage frais. It is similar to a yogurt culture but a different strain which acts at a lower temperature (mesophilic as opposed to thermophilic cultures). Many recipes skip this step. Rennet can be ordered from any pharmacy in France; and I imagine through mail order in the US, in liquid or powdered form. Once the rennet has set (about 24h at room temperature), the “caillé” is cut and set into a “faisselle” to drain. Once it has drained to you liking, you can stir it, or not, and eat it. This is fromage blanc. In my experience, it is tricky to get the culture just right. From time to time I get a bitter aftertaste in my cheese. What has worked well for me is is a product called Lactaline made by Yalacta. This contains the rennet as well as the culture. I can buy it through my pharmacist, but again you might find it through mail order. It has never failed me. It’s a bit of a project but there’s nothing quite like it, especially if you start with very good milk. A couple of years ago, a friend gave my husband a bouquet of wild strawberries from her uncultivated garden for his birthday, greenery and all. A beautiful bunch, they just fit in a small vase but filled the room with such aroma that you could hardly breathe without feeling the passion of the berries. They are long gone, but the memory remains. Ristorante Garga in Firenze serves them with zabaglione — YUMMMM!!! Frutti di Bosco are amazing. I just got back from Liguria in Italy where I enjoyed one of the more amazing desserts: It was a chocolate sorbet/semi freddo with zabbaglione and frutti di bosco. Exquis! I love to read your blog because you make me think about food as something delightful. I forget that, sometimes (okay, often). Thanks. This is just a thank you. As my third Paris summer draws to a close I’ve realized how many great food and other discoveries I’ve had through your blog over the years. Thank you for your entertaining writing, beautiful photos, and excellent suggestions. We met once quickly several years ago when I was the co-publisher of SmartsCo and we had just come out with ChocolateSmarts – you were signing your chocolate book and we were signing ours as well at Adam Smith’s chocolate store. That was before my summers in Paris and before discovering your blog. By the way those kougelfs at Vandermeersch were delicious, especially after a bike ride through the Bois de Vincennes. Looking forward to more…I’ll be storing up your suggestions over the next year for when I’m back next summer. We planted three fraises de bois plants in our (California) garden, and eat them as we pick. A barquette is a luxury indeed. These berries bring back memories. When I was growing up as a kid in Maine there was a meadow we’d go to beyond the pasture and through the woods where there were beautiful wild strawberries. I can close my eyes and remember it so well. There’s probably nothing better than wild strawberries. Memories of my childhood at our summer house by the lake. How we picked them and pearled them on a straw like we use to do here in Scandinavia. 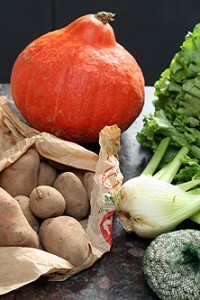 I have to say that moving to Paris recently has re-ignited my love of food and fresh produce. Since I arrived I’ve tried big wrinkly beef tomatoes and violet asparagus, released fresh almonds from their green fuzzy casings, seen produce at my local market change from one week to another to show the season’s best. Yes, it’s all more expensive. However, I am really enjoying eating and tasting and thus eating better than I was. I agree with commenter Lisa above that ‘good food is cheaper in the long run’ and with Christina, ‘pay more and eat less’. Thanks David for highlighting this message and letting us know to keep an eye out for the strawberries! Oh I’ve had these before and they are simply incredible. I’ve only been able to find them in Europe though and it’s true they are a pain to pick; they are so small they take forever. Half the time you end up eating them right there in the field. Still they’re worth it. I remember once, my uncle made a liqueur from these little wild strawberries and it was so fragrant and bursting with flavour I couldn’t get enough. I wish you could find them in North America but I have yet to see that happen. Big Hug Studio: They’re not all that common in France either, but you can find them in certain greenmarkets in the states and some larger berry growers will infrequently have them. But their very short life makes them not so profitable to pack and shop. My hubby is Swedish, and therefore a lover of all things involving wild strawberries (smultron in Swedish). They are just so beautiful, and much more fragrant than their larger cousins. Thanks for such a lovely post. Here in PEI Canada our tiny little Fraises Des Bois are just starting to appear. On our property they grow in little corners where they are not disturbed by the lawn mower, under shrubs and behind them. I consider them a national treasure.I wonder what would happen if we stopped mowing!! You may be poorer in your bank account, but not in your soul! I love those strawberries, they are always a treat. My wife loves strawberries so this year we decided to grow our own. We bought two hanging baskets with three plants in each for around £6.00. The strawberries we have had have been amazing, nothing better than fresh picked strawberries still warm from the afternoon sun. Yes David, those are the ones I bought. I have never found them again. I cannot not agree with you, la bonne nourriture coûte cher! These tiny strawberries looks pretty perfect to me! and THAT’S what it’s all about! :) Thanks David for summoning up my philosophy perfectly. For incredible things, I’m willing to pay more, because it makes me happy. Every week in July, I come home with a flat of tiny, Minnesota strawberries and every week, I think gelato… pies…. and every week they get gobbled up within 24 hours – just a they are – without even a sprinkling of sugar. I bought a series of strawberry plants from the farmers market to see what will work in my back yard. Strangely, the frais du bois are the only ones that have made it. I don’t bother collecting them for my family and make a fine dessert. Nope, I just sit in my garden, popping the earthly delights in my greedy mouth, and daydreaming the time away. When you spend more money to buy better food at home you will probably eat out less since the food out will not be as good as what you have prepared at home (depending on your cooking and where you generally eat out, of course). In the end, you will probably save money. That’s my belief. Happily they are easily grown at home, here in Los Angeles, anyway. And the flavor can be so intense in the really ripe ones that a single little berry makes one feel that they’ve had dessert. I also like the way the berries are held up off the ground on the plant. I thought I had lost every plant of my original unknown variety from neglect and had one spring up magically in a distant flowerpot last February. I was ecstatic when I spotted those tiny accordion-pleated leaves. Now it is sending runners everywhere. In the meantime I researched and bought two other types. While I agree with everyone else’s comments on goodness and uniqueness of experience being worth the expense, I can’t help but add a point that I’m surprised no one has yet made. It doesn’t matter how worthwhile something is or how justified (or not) is it’s price; if you don’t have the money, you can’t spend it. As a dead-broke graduate student (in wine science, no less) with access to a very nice farmers’ market and excellent local produce, I weep at the sight of $4 bunches of local mizuna and $6 local melons and $5 pints of local gooseberries, radiant in their beautiful freshness, then turn around and spend my nickels and dimes on mass-market cabbages and oranges at the discount grocery store. I would far rather buy the local produce, and I believe that it’s worth it, but I can’t spend what I don’t have. Berries, however, are a different matter, because those I can pick. For the price of a few enjoyable mornings and evenings out of doors and a little patience, I’ve filled my freezer with wild blackberries, black raspberries, huckleberries, and the occasional feral currant or cherry. 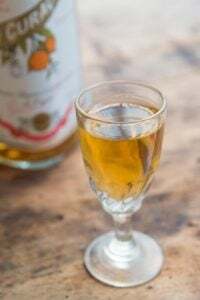 The fraise des bois never make it that far. I’ve not bothered to grow out of my childhood habit of eating them straight off of the plant. But please do remember, all ye people of means, that some impovershed folk would really, really like to buy the good, local stuff, but simply can’t. And no, I don’t buy junk food or cigarrettes or movie tickets, either. szymanskiea: I’m all for things being as affordable to all as possible, but the people who make and grow food deserve to be fairly compensated for their work. It’s nice that the imported garlic is cheap so people can buy it, but am not sure that’s a good long-term solution to problems of food safety, carbon footprints, and all that other stuff. A lot of things, like berries, are just a lot of work to cultivate and pick. Luckily up-pick places offer more reasonable options, but for those who don’t have cars, that option is out of reach. I think things like buying co-ops and CSAs can be great ways to get good food at affordable prices if those options are available. I completely agree with you David about the price. When something is harder to grow or cultivate the farmers need to be compensated for their efforts. Since I can’t grow any plants to save my life, I have tremendous respect for them. As for fraises des bois LOVE LOVE LOVE! I haven’t had them in ages, but this post definitely made me crave them. Now I’m going to be on the look out whenever I go to local farm markets. I live in Vancouver and I’m lucky enough to have a lot of fresh local produce…so far I’ve been enjoying local farm strawberries that taste soooo much better that supermarket bought ones. Now fraises des bois are next on the list. Another great post David, thank you! I shop at the farmer’s market on a weekly basis in NYC, while I refuse to pay $6 for a quart of strawberries that taste like the ones from the supermarket, I have no problem searching the good ones out and paying $7 for those. If I get lucky, I land on a 2 quarts/$10 stand that has awesome berries. That said, I think that raspberries and blackberries are overpriced. I know how much work goes into picking them, but for some reason -I think growing up with raspberry and black raspberry bushes in the backyard- I can’t bring myself to pay so much money for a pint of them. Maybe I’ll change my mind this year because I miss good berries! I try to buy all of my meat from the local guys, and it is so expensive! But, I find that you end up eating less meat and appreciating it more when you’ve spent so much money on it. The quality can’t compare to the store bought stuff. The good garlic, from the farmer’s market, while expensive, is so worth it!!! Szymanskiea: I feel your pain, when I was a teacher at a private school, with boatloads of student loans that I still have, I had $40 a week to spend on anything from groceries to toothpaste. It was very difficult. Basically, I managed to shop at Whole Foods, bought everything that was both on sale and locally grown, sometimes even organic, and ate really well. My husband and I still spend about $50-60 a week on food and we shop mostly at the farmer’s market. If anyone thinks that food is too expensive, they should start a garden. If they find it’s too much work, that might help them understand why food costs as much as it does. 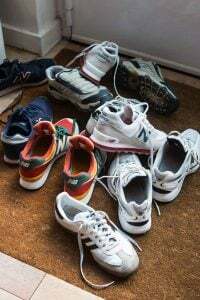 And if, on the other hand, they find it’s not too much work, they’ll have the double benefit of fresh fruit and vegetables and good exercise. If you don’t have the option of gardening, eating local and seasonal can make a difference in your grocery bill. Look for a farmer’s market or local produce store. My local produce market has started listing the sources for their fruits and vegetables, which I think is a great practice. I love Fraises de Bois ~ they grow wild on Orcas island, in the San Juans. They taste so good ~ like woody bites of honey! I took a few photos ~ I’ll link to your post, if that is okay. We used to order little bowls of them after lunch on the beach in the south of France. Thank you for the story. That stinks! Doesn’t seem like much, but when you run the current exchange rate, whooee! I am planning our trip to Paris for December and keep saying to my husband regarding restaurants, “nope, can’t go there, or there, can’t go there either” they are all too expensive! i’ve been growing these strawberries in a basket in my patio. apparently for my squirrels. pam: Even with the crummy exchange rate, a number of things are still a lot less expensive than in the states: pure butter croissant (.95c), baguette (€1), a glass of wine in a café (€3 is around what you pay for a glass of ‘house’ wine), and there’s a number of nice restaurants in Paris that have €30-€35 3-course menus, and that price includes tax and tip, which, even with the exchange rate, is still very reasonable. Tim: I wish I could have a garden, but you’re right, the amount of work is a lot. So am pleased to buy from producers (rather than wholesalers) as much as possible. Just saw some at the Downtown Farmstand here in Chicago. If I’m up early may get a flat at the market tomorrow for eating and jam making. We don’t drink alcohol or smoke, & I don’t eat animals, so what we spend on food & putting up food we do. 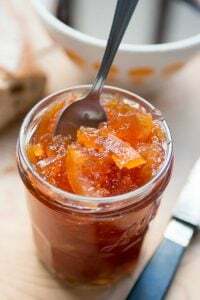 May even gift a jar of jam at a holiday party raffle for the LTH Forum. Here on Vancouver Island, it’s local strawberry season. They are sensational. And I drink, eat animals (and wish I smoked) and they are still worth every centime. Thanks for the reminder re: the good croissants, baguettes, etc. The mediocre ones here run $2, and the margarine (or whatever it is) croissants are crazy expensive. The best is macarons for $2 a piece that are made with imitation vanilla. I love having a huge farmer’s market 20 minutes away, and a good one that has everything you need 10 minutes away. Makes you feel spoiled when you live on the third floor and only have a fire escape, and no country house! Love this post and the sentiment it extols – so timely and important. I am always willing to pay more for better taste and careful nurturing of my food. Thank you! What memories those fraise bring. Each year in strawberry season here in SoCal, I think back to the five years my partner and I rented the proverbial house in Provence. Late sleepers, both of us, we’d awaken at 6 AM in order to be among the first at the local market to snare the fraise. Somehow, they never made it home as we ate our way up the hill to our house. Its been difficult to eat a cultivated strawberry since. They are truly one of the 7 wonders of the world! And the aroma! Afew years ago I bought 6 wild strawberry plants for $25 and thought I was nuts, but, aside from the fact that the robins get there first every morning, those plants have given me a small steady supply of great strawberries. Now it’s getting too hot for them, but June was productive! Is fromage frais similar to fromage blanc? 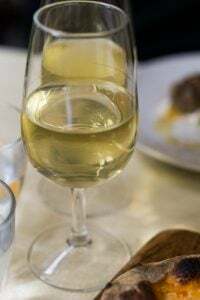 I really enjoyed fromage blanc in Paris and would love to find it in the States. 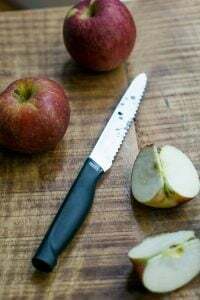 Jon Rowley in his “Beautiful Taste” blog talks about the Rainier cherries Al and Becky Courchesne from Frog Hollow Farms sent him, and gives some good tips, as he always does. 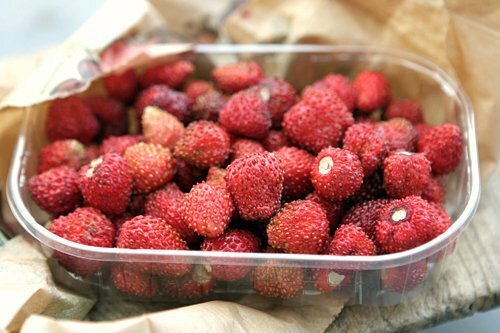 I was thinking about these just yesterday and wrote to a fellow blogger that I had never seen fraise des bois in the US; glad to know they can be found albeit at a price; we used to pluck them with delight when we lived in France, we’d find them hidden under grass in our garden, tiny tiny gems. What beautiful pics! We have found tasty berries around the world! How well I remember a little old lady in my hometown in South Carolina who grew strawberries in her small garden. I can smell those gorgeous red berries now! When we were in Germany a few years ago we stopped at a pick your own berry place in Landstuhl. Boy, the strawberries were some of the best we have ever had! Just a few days ago our son mentioned picking wild blackberries near London when he and his wife lived there for two years. He spoke of how fantastic they were and how much he loved (and misses) eating them. My in-laws enjoyed pies every year in Pennsylvania from the blueberry plants brought up from Maryland. I love your blog and just today finished reading your book The Sweet Life in Paris. It was quite entertaining! I had many laughs and enjoyed reading about your adventures. I carried the book everywhere and didn’t want to put it down! I can’t wait to try your brownies! Speaking of Connecticut, I have a son-in-law who lived there. We enjoyed Paris last year and would love to return some day. It is now our favorite city and had the best bread ever! The French were nice to all in my family who traveled there! Enjoy the beautiful life in Paris! David, this article just cracks me up! Your description of stopping the car just to eat a rib due to the intoxicating fragrance of freshly cooked barbeque just made me laugh so hard. I could imagine it being made into a food commercial. I love your sense of humor. Keep writing! I’d also love to eat those wild strawberries one day. How I agree; fraises des bois are the very best. But what really caught my eye in your pictures was the tub of 20% fat content fromage frais. I can’t imagine how it must taste or feel. Here in UK it is impossible to find any brand (french or home produced) with more that 8%. Lucky you! 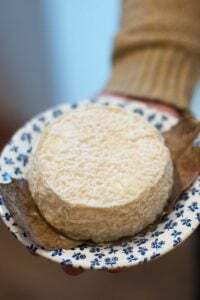 You might want to check the labels where you are though, because often the percentage refers to the butterfat content (la matière grasse), not the actual fat content of the finished product (la matière gras sur extrait sec which is often half of that). In a move to entice diet-conscious consumers in France, often they now list both fat amounts on the label – especially on cheeses, because so many people are watching their waistlines. One of the best things about living in Pittsburgh is Soergel’s Farms. I am originally from Los Angeles and it’s taken me a while to find a “best thing about Pittsburgh” but now that I have found Soergels Farm I am happy. A week or two ago, Soergels had the most delicious little, tiny strawberries. I bought three boxes and we finished them off in a day. They tasted the way strawberries were meant to taste. I am already waiting for next year when they’re available again. Waht a treat to get a hold of such strawberries. Here they are rare to find. We have wood strawberries growing in our yard which are quite different from fraises des bois. When they first appeared I thought “wonderful, we have fraises des bois with absolutely no effort on my part, plus I have an excuse not to mow the lawn.” Then I tried eating one. Absolutely no flavor whatsoever. Quite disappointing, and now they’re everywhere in my lawn. At least they’re pretty. Your story about the aroma of barbeque in your car reminded me of taking the crosstown bus home from work in Detroit years ago. As the bus went through African American neighborhoods it would pass traditional barbeque restaurants that had outdoor grills. There was no air conditioning on the buses so in the summer the windows were open; the aroma from the ribs was enough to drive you insane with hunger. I don’t particularly like ribs, but it still smelled wonderful. I read this at work on Friday and I’m sure you can imagine my happy dance when one farmer at Green City Market in Chicago had a box of Fraises des bois for sale today! I gladly spent the money for something I knew would be a delicious treat for fourth of July. I have some whipping cream in the fridge to whip up. yum yum yum! Thanks for the tip! Evie, I hadn’t realized wood sorrel was edible. LOL, I’ve been cursing it as I pulled it out of my vegetable garden. Maybe the ultimate revenge is to eat it. I wanted to grow blueberries, so this year I bought three 4-year old plants, paid someone to dig the holes, bought peat moss, mulch, black cloth & altogether had about $100 invested. But there were blossoms. Then berries. Last week I figured they must be ripe & guess what? The birds had eaten all except one tiny berry that was hiding in the leaves. It was tasty – but talk about expensive fruit! Daveed, just finished your Paris book & laughed clear through, leaving the recipes to the second round. There are many that I must try. Your writing never fails to amuse and educate me. Thank you so much! wow, that looks so good with the fromage frais! i know what you mean about the quality food costing more because it SHOULD cost more! still, it leaves me in a bind. i’m grateful for cheap food because poor people can afford it. if food cost what it should, there would be a lot of people not eating. of course the creation and processing of cheap food usually exploits other poor people (and lands). don’t know what to do about that. Nothing compares to the sweet aroma of wild strawberries.Your beautiful photos and commentary brought back wonderful memories of growing up on a dairy farm in upstate New York. My brothers and I would spend lazy summer afternoons in the back meadow picking and eating berries. I still tend to measure all other treats against those berries, biscuits and whipped cream! These images evoke memories of wild fragolini di bosco from Lake Nemi, in the Alban Hills outside Rome. They would sell them by the roadside, freshly picked, in the surrounding woods. Hiking in the Austrian Alps, I have found them too. Such a welcome snack, sitting down on the moss and picking one by one. Yes, good food may cost more, but there are so many ways to offset the expenses, less meat, for example, is one easy way. Eating vegetables and fruit in season, another one. I appreciate the care farmers put into growing sustainable food and my purchase supports a way of life I do not want to disappear. Merisi: To counteract the belief that vegetables were expensive to the French, an organization here launched an ‘ad’ campaign that showed that a quart/litre of soup could be made for the same price as a cup of coffee in a café. It was pretty interesting. I did have a conversation once with someone here who told me that vegetables were indeed “too expensive.” I don’t buy much beef, but the last time I did, I paid about what I did for a whole basket of vegetables from the market. Martha: So glad you liked the book – hope you enjoy the recipes, too! Jackie: Yes, you can find them if you hit it right. But they’re so perishable that they disappear quickly. Some things you just do for your soul. Thank you for explaining (once again) why good quality food may cost more. Unfortunetely, I think you’re preaching to the choir, so to speak. I assume most of your readers/followers understand the concept. But it is a good time to mention that if people grow their own food, starting with herbs in pots, anything to get the ball rolling, producing their own great quality food is obtainable, feels good, great for the soul, the earth and our wallets! I just often think we need to remind ourselves (myself included) that it’s okay to buy yogurt made by a small, local producer instead of the gallon drum at the supermarket, or some very special fruits once in a while, if it’ll make you happy. This comment is not about strawberries, just a general comment to say I am so thrilled to have just found your site, am also reading A SWEET LIFE IN PARIS and am loving every moment of it. I feel so inspired by your work!! Loved your description of how you turned your apartment into ONE BIG KITCHEN!! Keep up the good work, and I must say that although I have not been to Paris yet, I will enjoy living through you vicariously with all your cooking adventures. It all comes down to those simple pleasures. Kudos on taking the time (and breaking the bank) to have that blissful berry moment! Oh yes, there are some very good Middle Eastern restaurants in Detroit and Dearborn, which is a suburb of Detroit. The Detroit area has the largest Arab population outside the Middle East, and they like food as much as any one does. My introduction to Middle Eastern culture was through a Middle Eastern restaurant in Detroit. I decided that I needed to learn more about people who could cook like that. Does this mean I think with my stomach? And about the relative cost of vegetables versus other foods: yes, I agree totally. I’m often struck by how little I pay for a large bag of fruits and vegetables at my local produce market. The farmers, on the other hand, have figured out that people will pay what they are used to paying at the supermarkets, so the farmers market here isn’t much cheaper, although the vegetables are fresher. And actually I don’t mind more of the profit going to the farmer. Fraises des bois are one of my favorite things on earth. I first had them several years ago on our first trip to France. This time I got to try Berthillion’s ice cream version – yum! They are like the essence of strawberry distilled down and concentrated. I would definitely splurge and enjoy them for the little bit of time they are available. 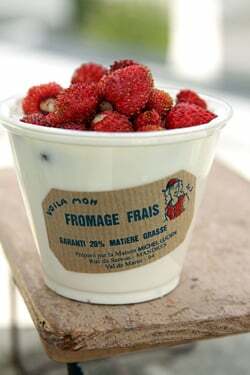 Your fraises des bois look absolutely stunning .What a beautiful treat they must have been with the fromage frais. I’m glad you decided to treat yourself. I’m an epicure by nature; my dear late mother used to say I had champagne taste with lemonade money. 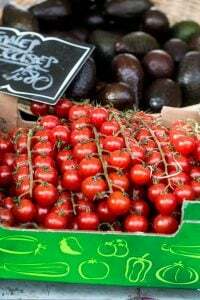 about good food costing more, it was already true in the seventies and eighties in Paris. This was before the euros. One of the reasons I switched to working in food for a living was that I had been spending so much of our budget on good products to feed my family and friends, I might as well make it a full time job ! And there is always a way to balance things out. I saw these for 18€ la pièce the other day and admit I was shocked but you are so right that every now and then one just has to treat oneself and I can only imagine the work they are to pick. At the moment, I am on my own and can’t *quite* justify the cost but I am *this* close. They just look SO good. We had tiny little wild strawberries growing in our backyard, right where the backyard ended and the woods began. It was a race between us and the deer and bunnies to get as many as we could. The wild strawberries were wonderful; I can barely stand the sight, let alone the taste, of those gigantic, fibrous ones I see in stores now. Yes! I love the tiny wild strawberries. Berried Treasures Farm here in New York sells theirs at the Union Square Greenmarket. They’re tasty on their own, but last week we mixed a few up in some cocktails—yum! Hi David! Please stop by Stéphane Secco’s bakery (the one on rue Jean Nicot in the 7th), they are making “Panna Cotta aux fraises des bois” and it’s absolutely delicious.It’s a verrine, with puff pastry (like the one you use for millefeuille) on the bottom, then panna cotta (but it tastes a bit like mascarpone and tiramisu), and on top of it, fraises des bois… You have to try this! The most delicious cake I ever had was years ago in St Tropez, something called “Tarte Tropezienne”, which was a plain yeasted cake split and filled with (pastry?) cream and those wild strawberries. 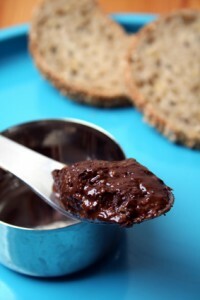 The dough was lightly sweetened and I have been looking for a recipe ever since – can you help? I love that, a little poorer but much happier :) Being able to eat like that is worth every penny! I had my first ever in my life organic local berries last week and I can’t believe I never splurged on them before. Totally life changing. Also, per hearing a mention of it here (I’m pretty sure..) I picked up some Theo chocolate, which is thankfully sold everywhere around here, and it’s my weekly splurge now, price be damned! That stuff is gold! Have given up trying to grow these in my garden. The birds know a good thing when they see it! Just was reading a Ruth Reichl quote on the frase de bois and i didn’t know what it was. Your photo is exactly what I imagined when I read it. Thanks for enlightening me! 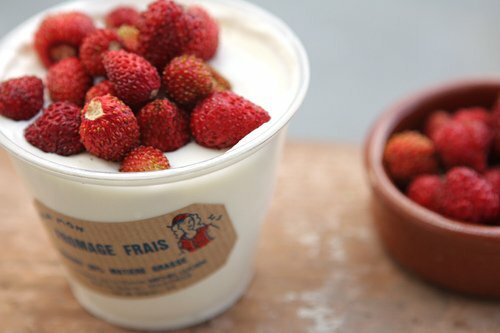 Where in NYC can I buy frais de bois? Try Dean & Deluca, Fairway, or the Greenmarket in Union Square. I had Fromage Frais on an Air France flight. I had no idea what to do with it – it didn’t seem to go with anything else on the tray – so I ate it with the delicious little cookies for dessert. I haven’t seen either the cookies or Fromage Frais around here so I guess I’ll have to fly on Air France again, soon. I was starting to think that I had imagined it.